Follicular Dendritic Cells and the Humoral Response. (The Immune Disease Institute and Program in Molecular and Cellular Medicine, Children's Hospital and Harvard Medical School, Boston, Massachusetts, 021115). Follicular dendritic cells (FDCs) are located in B cells follicles of any secondary lymphoid organs. FDCs have very important functions regarding the generation and the selection of high-affinity plasmocytes memory B lymphocytes during the adaptative response. One key property of the FDCs is their ability to trap and display antigens as immune complexes in a highly stimulatory way to proliferating B cells. Here, we will review these properties and replace them in the context of the humoral response. Memory B lymphocytes with high-affinity BCR are formed in lymphoid follicles (Fo) upon exposure to pathogens. 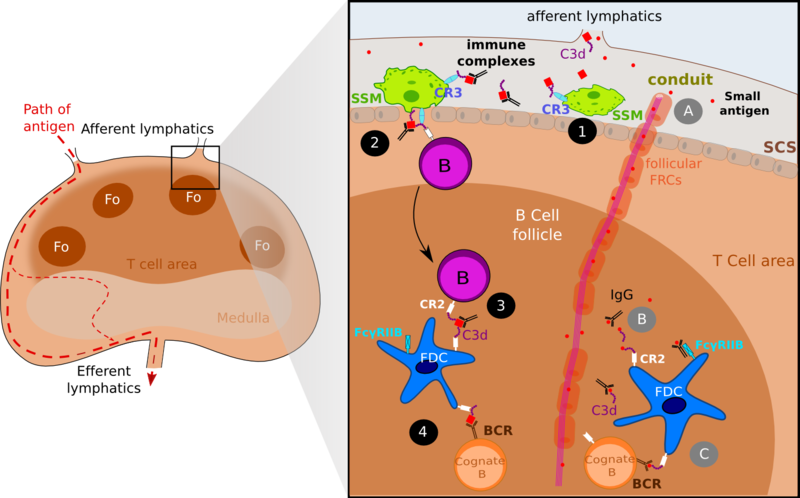 B cell follicles (Figure 1) in secondary lymphoid organs exist either in a quiescent state (primary Fo) which are largely composed of naive B cells in search of cognate antigen (Ag) and activated Fo (secondary Fo) containing a germinal center (GC). GCs are a key location of the generation of high-affinity memory B lymphocytes. GCs are located within secondary Fo and this is where mature B cells can proliferate, undergo somatic hypermutation (SHM), class-switch recombination and differentiate into high-affinity plasmocytes and memory cells. Proliferating GC B cells undergoing SHM yield a progeny of B cells with different affinities for the initial antigen, thus another event proposed to occur within GC is the competitive process of selection, where GC B cells are eliminated by apoptosis unless they can compete for survival-signal associated with Ags ••. In addition to B cells, follicular dendritic cells are an important population in the Fo. These dendritic-like cells were identified some forty years ago in studies tracking labeled Ags because FDCs seemed able to retain Ags [2,3]. What was unexpected is that this follicular cell type is capable of retaining Ags for very long periods, in the order of months and up to one year in some cases . Mainly located in GC and B cell follicle (Figure 1), the intimate association between B cells and FDCs plus their ability to trap and present native Ags in the form of immune complexes indicates that this cell type is a crucial component of the humoral response, as well as mature T cells or Ag-presenting cells. Recent studies have elucidated how FDCs are able to trap Ags and present it in a highly stimulatory way to B lymphocytes, comforting the idea of a central part of these cells during the humoral responses. Here, we will try to review the properties of follicular dendritic cells and their implication in the germinal center reaction and more generally in the humoral response. Figure 1. Schematic representation of the structure of a lymph node. Schematic representation of the structure of a lymph node. (a) Schematic representation of a lymph node, showing the different areas. Lymphocytes enter the lymph node via high endothelial veinules (HEV) and enter follicles or the paracortical area. Antigens enter the subcapsular sinus (SCS) via afferent lymphatics and escape the lymph node via efferent lymphatics. 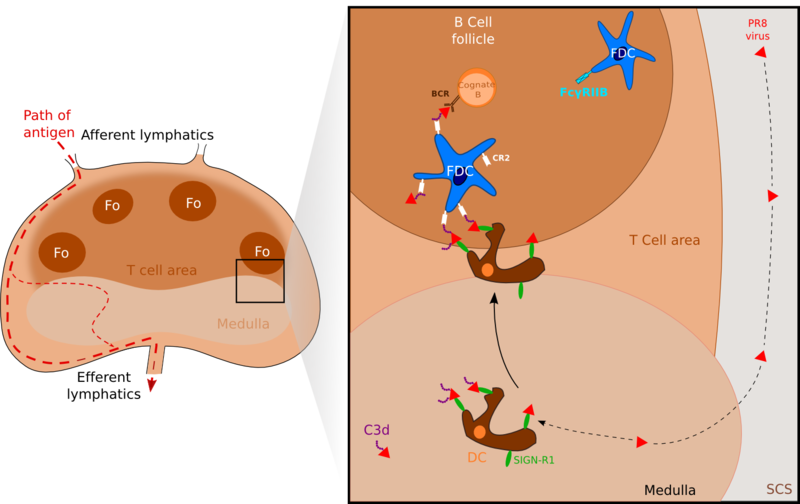 (b) B cell are directed to follicles (Fo) whereas T cells are located to the paracortical area (Pc) following chemokines expression: CXCL13, a B-cell chemoattractant is transported in follicular conduits while CCL21 and CCL19 which attract both T cells and dendritic cells (DCs) is transported by para-cortical FRCs. (c) Focus on a germinal center where antigens in the form of immune complexes are acquired by B cells and then presented to follicular T helpers (LTFh) via the MHC class II molecules. Following this encounter, B cells differentiate into antibody secreting cells or memory cells. ( Adapted from  ) . A major role for FDC is to present Ag in the form of immune complexes (IC) to naive B cells in primary Fo as they can survey and to GC B cells so they can compete for Ag within GCs. ICs can be composed of Ags and antibody, antigens and complement (C3 fractions) or all the three-types molecules. Ag and antibody (Ab) complexes can be formed early during the infection, as pre-existing natural Ab are able to bind Ag while activation of the alternative or lectin pathway could explain the complement (C3) containing immunes complexes. It has been shown that the large surface area developed by the FDCs expresses both complement receptors, such as CR1 (CD35) and CR2 (CD21) , and Fc receptor such as FcγRIIb (CD32) and FcεRII (CD23) through which FDCs trap and retain immunes complexes . The trafficking of B cells and B cell Ags in lymph nodes has been very well studied and is described in past reviews ••. There are many different pathways by which Ag is transported into Fo. Pathways involved rely on different factors such as molecular weight of the Ag, the presence of natural reactive Ab, as well as the activation of the complement system. Therefore we will focus on the different ways FDCs within Fo acquire Ags. The first way Ags are acquired by FDCs concerns small Ags and is directly linked to the fibroblastic reticular cell (FRC) conducts. FRC conducts are collagen-rich reticular fibers, which are ensheathed by a basement membrane and a layer of fibroblastic reticular cells. Discovered some 30 years ago in studies examining the anatomy of rat lymph nodes . FRC conduits were originally thought to provide infrastructure to the B cell and T cell area. Thanks to multiphoton intravital microscopy (MP-IVM), recent studies have identified further roles for these FRC conducts: these conducts can drain chemoattractants or chemokines from the draining lymph to the HEV within LN. Similarly, it has been shown that follicular conducts provide a passive entry for small molecules to the B cell area. 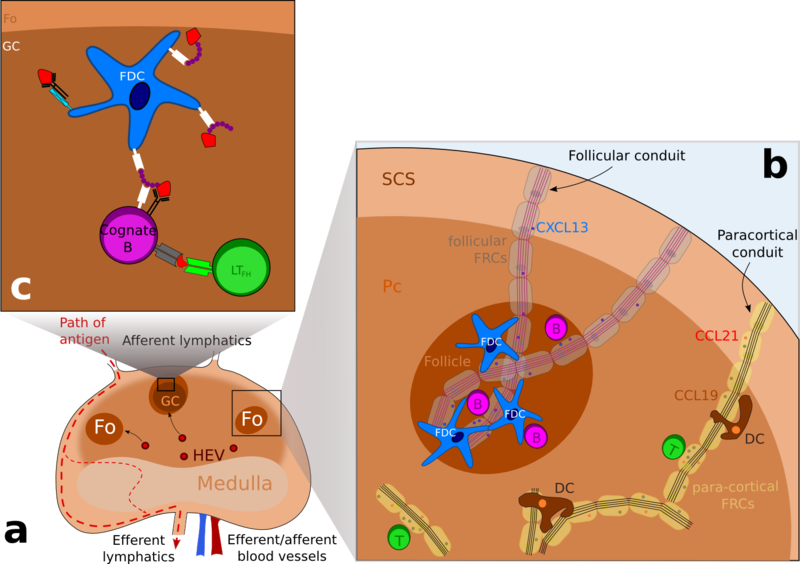 As follicular conduits (Foc) and the FDC network are interconnected, Foc provide direct connection for small Ags to the FDC surface where they are picked-up via complement receptors and Fc receptors (Figure 2) [9,10]. In their study, Roozendaal and colleagues injected in anesthetized mice small (turkey egg lysozyme; TEL) and large (phycoerythrin) Ags and then visualized in real time the repartition of Ags. While the TEL seems to drain passively trough the conduits and access to the FDC processes, phycoerythrin which is too large to enter the conduits remained located to the subcapsular sinus floor. The frontier between small and large Ag could be directly linked with the physical properties of the FRC conducts: the inner tubular space of the conduits is thought to be accessible only to molecules of an approximal molecular weight under 70 kDa . As Gonzalez and colleagues point out ••, this size exclusion of conduits raises a dilemma for understanding how ICs -composed at least of an Ag and a complement component or one IgG- can access Fo. One possible explanation is that small Ags get tagged as soon as they exit the conduits and gain access to the Fo: IgG transported across LN sinus can bind small Ags within Fo while activation of the complement pathway within GCs results in C3-coated Ag which provide a ligand for uptake on CR1 and CR2 receptors (Figure 2). Figure 2. FDCs acquire antigen via active transport and via follicular conduits. FDCs acquire antigen via active transport and via follicular conduits. Both small antigens and large antigens as the form of immune complexes gain access to the lymph node via afferent lymphatics. Immune complexes are captured by sub-capsular (SCS) macrophages (SSM) via the complement receptor 3 (CR3) (1) and then IC are off-loaded to naive B cells via CR2 (2) . Eventually, migrating follicular B cell delivers ICs to FDCs (3) . One addition step is the presentation of ICs to cognate B cells (4) . Small antigens gain access to B follicles via follicular conduits (A) where they get tagged by IgG or complement molecules such as C3d (B) . 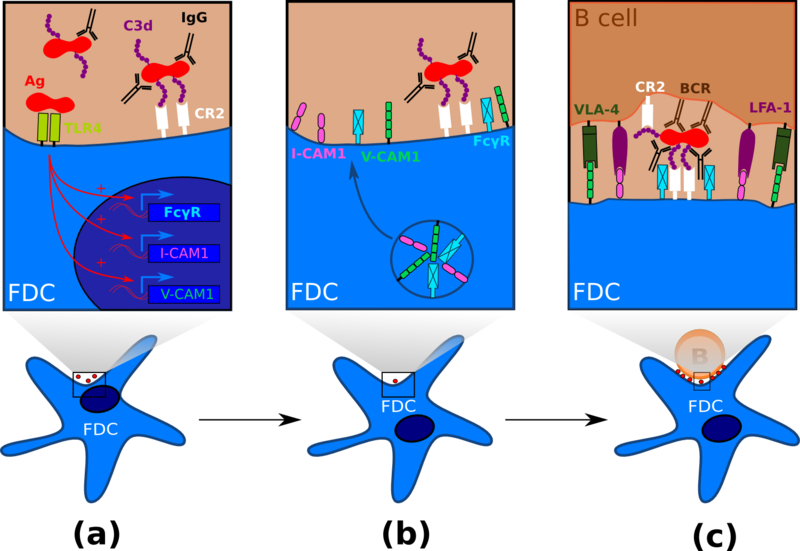 ICs thus formed are captured by FDCs wia CR2 and Fc receptors, and later on presented to cognate B cells (C) (Adapted from ) . In contrast, the second way FDCs acquire Ag concerns larger Ag complexes - above 70 kDa approximately- that cannot diffusive passively into the Fo and therefore require active transport by accessory resident cells. FDC uptake of the Ag appears to occur in three-time frames and involve several cell types (Figure 2). Early studies already suggested that B cells may be involved in immune complex transport to FDCs  as other studies suggested a role for dendritic Ag transporting cells [13,14]. Use of MP-IVM to track fluorescent-labeled Ag into draining lymph nodes has helped solving the way large ICs are acquired by FDCs. In their study released in 2007, Phan and colleagues •• passively immunized mice with polyclonal antibodies specific for phycoerythrin and then gave them a subcutaneous injection of phycoerythrin (PE) to generate PE-ICs in vivo . These ICs activate complement, resulting in covalent attachment of C3. The C3-coated complexes are captured by the subcapsular (SCS) macrophages of the draining LN within 15 minutes after injection and later on, follicular B cells capture ICs from subcapsular macrophages in a complement receptor dependent way . Finally, migrating follicular B cells deliver ICs to FDCs. SCS macrophages have been found to have limited phagocytic activity and to retain Ag on their surface . SCS macrophages express the C3b receptor (CR3) which has been proved to promote both the retention of immune complexes and the shuttling process to migrating follicular B cells . C3-ICs complexes are off-loaded on non-cognate B cells that take up the complexes via CR1 and CR2 . Within a few hours after administration of PE into preimmunized mice, a relative high frequency of follicular B cells acquired PE-ICs, showing that this shuttling process is strikingly efficient. Non-cognate B cells loaded with ICs migrate to the FDC network, where again the complexes are transferred from B cells to FDCs. Again, this process seems highly efficient in vivo and it is most likely the relative higher density of CR1 and CR2 on the FDCs surfaces that mediates the directional transfer, however it has not been proved. Another way has been identified recently and involves DCs residing in the lymph node medulla which as SCS macrophages sample particulate Ags. Using a UV-inactivated PR8 strain of influenza A, Gonzalez and collaborators  found that the inactivated virus was captured by LN-resident macrophages via SIGN-R1. Blocking of SIGN-R1 resulted in impaired local humoral response while elimination of CD11chi DCs -including lymph-node residing DCs- blocked both the T-dependent and the T-independent humoral responses to inactivated influenza. Notably, virus-bearing DCs were observed to migrate to the FDC area in a nonrandom manner whereas virus-negative DCs and DCs tracked before virus injection migrated randomly. Altogether, these results support a model in which the resident DCs transport the virus to the B cells Fo, where it is transferred likely to FDCs or to other DCs (Figure 3). Unlike the observations with C3-ICs, B cells did not appear to participate to viral transport. In their study with the bacteria Streptococcus pneumoniae , Kang and collaborators  observed concordant results showing the major role of SIGN-R1 on LN-resident DCs and proposed that C3 deposition was essential for uptake of S. pneumoniae on FDC. Hence, one model suggests that capture of a viral Ag via SIGN-R1 leads to activation of the medullary resident DCs and migration in the direction of the B cell compartment, where Ags are uptaken by FDCs via the complement receptor 2. Figure 3. FDCs can also acquire antigen via medullary DC. FDCs can also acquire antigen via medullary DC. Antigens such as the PR8 strain of influenza A or Streptococcus pneumoniae are captured by medullary resident DCs via their receptors SIGN-R1. Activated DCs migrate to the B cell compartment where antigens are uptaken by FDCs via the complement receptor CR2. (Adapted from ••). In spite of a long period of study, the sites of first encounter between B cells and Ag have only been recently visualized. These studies revealed roles for antigen-display DCs and subcapsular sinus macrophages  as well as evidence of B cell first encounter with Ag within Fo, where naïve or cognate B cells engage BCRs to acquire soluble Ag . Concerning FDCs within GCs, their immune complex display activity has been thought to provide a depot of B cell Ag for which GC B cells compete during the process of antibody maturation. Early observations of FDCs in passively immunized mice  using electron microscopy revealed that structurally, FDCs dendritic processes can have either a smooth or a "beaded" appearance. Beads which measure 0.3 to 0.7 micron diameter consist of series of interconnected and periodically arranged IC coated bodies, which are termed "iccosomes". More recently, scanning of IC-bearing FDCs using high resolution electron microscopy revealed that ICs trapped by FDCs showed a distinctive spatial periodic arrangement, each iccosome being separated from another by 250 to 500 Angstrom . As a matter of fact, this periodic arrangement of epitopes is to be linked with the known ability of TI-2 Ags to crosslink multiple BCRs simultaneously which provides a very strong signal for B cells to survive without T cell assistance. The observations suggest that ICs presentation at the surface of FDCs, as TI-2 Ags, promote cross-linking of multiple BCRs, thus resulting in B cell proliferation ad differenciation. A certain number of in vitro studies have showed that in the presence of FDCs, ICs are potent and efficient immunogens i.e. they can promote in vitro maturation of B cells [23,24] and GC reactions such as SHM of Ig and class-switching •, while free ICs inhibit B-cell function and are poorly immunogenic . Blockade of ligands and receptors on FDC or B cells helped identify several important molecules implicated in B cells-FDC interactions, including CR2 or the Fc receptor FcγRIIB. Early indirect evidence already indicated a role for Fc region of Ab for the regulation of Ab level in vivo  while the formal role of Ab involved in ICs has only been understood recently. As mentioned earlier, free ICs are poorly immunogenic because Ab engaged in ICs can activate in vitro the immunosuppressive immunoreceptor tyrosine-based inhibition motif (ITIM) signaling at the B cell surface by coligating BCR and FcγRIIB, resulting in poorly or no B cell maturation . However in the presence of FDCs, Ag-Ab complexes have been showed to be highly immunogenic i.e ICs can easily induce B cell maturation. Recently, IC-stimulated FDCs have been observed to upregulate the Fc receptor FcγRIIB  suggesting a role for FcγRIIB either in the retention or processing of ICs. Actually, in a study released in 2003, Aydar an colleagues showed that to a high expression level, FDC FcγRIIB bind Ig Fc region as soon as they enter follicles thus reducing coligation of BCR and FcγRIIB at the B cell surface and minimizing ITIM signaling . Taken together, these studies suggest a model in which ICs challenge results in FDC FcγRIIB level increase of about 50-fold, thus becoming markedly higher than on B cell surface. FcγRIIB on FDCs binds all Fc Ig in ICs and only a very small part of FcγRIIB remains available to activate ITIM signaling, which render Ag-Ab immunogenic and able to promote B cell maturation (Figure 4). Altogether, these studies suggest a model for potent Ag display by FDCs: while the array of iccosomes and complement fragment potentialize the BCR signaling, upregulated FcγRIIB on FDCs membrane bind to Ig Fc and inhibits ITIM signaling in B cells. These observations explain how poorly immunogenic ICs are rendered highly immunogenic when presented by FDCs within GCs (Figure 4). Several recent studies have already proved closed associations between B cell migration and GCs FDCs during GC responses, and in spite of strong correlation between FDC retention of Ag and GC responses, B cell acquisition of Ag on FDCs remains elusive [32,33],•. Using two-photon microscopy, Suzuki and colleagues were able to observe FDCs interacting closely with cognate B cells, Ag capture by cognate B cells during such encounters •. Then, surprisingly, the cognate B cells acquire not only Ag but also FDC surface Ags such as CR2 or BR-3 probably by a process called trogocytosis. These studies are very important as they establish importance for Ag display by FDCs after the first hours of Ag arrival in LN: B cell Ag is retained by FDCs and can be directly picked up from FDC membrane by cognate or naive B cells. Figure 4. FDC maturation and processing of antigen. FDC maturation and processing of antigen. (a) Immature FDCs within follicle capture and retain antigen in the form of immune complexes via the complement receptor 2. The membrane-associated pattern recognition receptor TLR4 recognize pathogen-associated molecular pattern and induces FDC maturation. (b) Mature FDCs within follicles or GCs express high levels of adhesion molecules and Fc receptors such as FcγRII. Fc receptors binds to the Fc fraction of IgG, thus rendering the antigen more immunogenic. (c) FDC interacts with a B cell after immunological synapse formation. Both VLA-4 and LFA-1 provide anti-apoptotic signals to B cells, while the BCR interacts with the highly immunogenic form of the antigen, hence inducing antigen internalization and B cell maturation. The "beaded" appearance reflects the presence of multiple IC coated bodies, known as iccosomes. In response to their encounter with Ags, B cells migrate to the T-cell zone where they can be fully activated as a result of their interaction with activated CD4+ T cells. Then, activated B cells can either migrate in the medullar cords of LN where they can proliferate and differentiate into antibody-secreting cells or mature into GC-precursor B cells and colonize a follicle to establish along with other cell types including FDCs, a germinal center where high-affinity memory B cells are formed during germinal center reactions (GCR) ••. GCs are specialized structures wherein B cells undergo clonal expansion, affinity maturation and class-switch recombination (CSR) . The GC reaches its maximal size approximately two weeks after the first encounter with the Ag, and then the structure slowly disappears. GCs are usually divided into three compartments: a dark zone mainly consisting in densely packed proliferating B cells called centroblasts, a light zone composed of non-dividing centrocytes, macrophages, T cells and a mesh of FDCs and the outer zone composing the border of the GC . According to the classical cyclic model, during the GCR the proliferating centroblasts within the dark zone undergo SMH of the IgV genes which encode the antigen-binding site of their BCR, yielding a progeny of B cells having different affinities for the original Ag. Centroblasts are then selected in the light zone for improved Ag binding and centrocytes eventually differentiate into high-affinity plasma cells or memory B cells . Recent live imaging studies [32,33],• of GCs challenged this model and suggested a revision of the B cell circulation within GCs and the functional relationships of the light zone and the dark zone . Histologically, GCs are distinguished by the presence of a dense mesh of FDCs, mainly located in the light zone and at the interface between the dark and the light zone [37,38]. Experiments in lymphotoxin-, p55TNFR- and TNF-deficient mouse (factors required for the FDC development) have provided insights regarding the requirement of the FDC network in the organization of the Fo and during the GCR (reviewed in ) even if those three molecules also affect other cell types within the LN, such as DCs or other stromal cells. In a study released in 2006 , Victoratos and colleagues used FDC-specific gene targeting against TNFR1 in mice to provide more direct evidence that the FDC network is required for follicle and GC developments. More recently, it has been shown that the selective FDC ablation before immunization results in disruption of follicular organization while selective FDC ablation during the GC response leads to disappearance of GCs and GC B cells dispersal . Altogether, these results highlight the absolute requirement of the FDC network to maintain and establish the primary follicle identity as well as to retain and promote the survival of GC B cells. The regulation of apoptosis in GC B cells is complex and unique. GC B cells have long been known to be especially prone to apoptosis , the major benefit of this pro-apoptotic nature of GC B cells being the quick elimination of B cells with newly generated immunoglobulin mutations that produce a non-functional or non-binding antibody. During the immune response, maturation of FDCs is mediated via TLR4 triggering •, resulting in upregulation of FcγRIIB and adhesion receptors such as intercellular adhesion molecule 1 (ICAM-1/CD54) and vascular cell adhesion molecule 1 (VCAM-1) (Figure 4). GC B cells express lymphocyte function-associated antigen 1 (LFA-1) and very late antigen 4 (VLA-4) [44,45] and it is well established that both LFA-1/ICAM-1 and VLA-4/VCAM-1 adhesion pathway are involved in B cell binding to FDC, therefore promoting GC B cells adhesion to FDCs [45,46]. Blockade or these adhesion pathway using mAb resulted in B cell apoptosis, therefore suggesting an anti-apoptotic role for ICAM-1 and VCAM-1 . VCAM-1 has also been showed to facilitate B cell adhesion and activation on antigen-bearing membranes (Figure 4) [48,49]. These results obtained in vitro suggest a model ICAM-1 and VCAM-1-expressed on the surface of FDCs promote B cell adhesion through interactions with LFA-1 and VLA-4 within GCs. Specific encounter of the Ag via the BCR triggers VLA-4 and LFA-1 signaling resulting in strengthened adhesions between FDC and B cell. Firm attachment of the B cell could induce immunological synapse formation [46,48], Ag uptake and B cell activation (Figure 4). Hence, FDCs upregulate anti-apoptotic molecules upon TLR4 signaling in GCs, leading to GC B cell survival, proliferation and selection of high-affinity B cells according to the GC cyclic model. Affinity maturation is a process occurring mainly in GC that generates high-affinity antibodies during humoral responses. The affinity maturation is a two-step process: first, proliferative B cells are subject to Ag-driven SHM of the IgV genes and then the B cell progeny that have undergone SHM is selected by FDCs for their Ag-affinity . Affinity maturation is usually followed by the CSR process that mediates isotype switching within GC B cells. Both SHM and CSR require the activity of activation-induced cytidine deaminase (AID), an enzyme which generates transvertions and transitions at C:G pairs (reviewed in ). In vivo , in vitro and in silico studies established the importance of FDCs both in SHM and CSR. Coculture of naive B cells, IC-bearing FDCs and primed T cells resulted in FDCs-lymphocytes cluster and Ig production, as well as a shift from IgM to IgG, change from low-affinity IgM to high-affinity IgG and enhancement of AID production while in the absence of FDCs, SHM and CSR were not detectable . Later on, murine GCR study  demonstrated that immunogen persisting on FDCs one week or later after immunization delivers a signal that promotes SHM in vivo. In silico studies correlated to in vivo observations  reported that TLR4-deficient FDCs is associated with a decreased humoral response, a reduction of high-affinity B cell number and impaired SHM in GC B cells. Taken together, these studies emphasize the formal part of the follicular dendritic cells in the humoral response and especially in the GC-related humoral response. First, FDCs located within primary Fo are able to trap Ags in the form of IC, turn Ags into an highly immunogenic form and present it to naive B cells in search of cognate Ag. Then, by the same mechanisms, FDC within GCs promote SHM, CSR and selection of GC B cells with the highest BCR affinity. FDCs are also implicated both in the structure and in the functioning of the GCs: FDCs retain GC B cells and induce B cell clustering and proliferation via ICs and anti-apoptotic signals such as adhesion molecules. More precisely, processed ICs and anti-apoptotic signals on the surface of FDCs are subject to a competitive selection among the B cells with different BCR affinities. Later on, IC-bearing FDCs provide a late antigenic signal promoting affinity maturation and CSR, provoking a high-affinity and diversified antibody response. The use of MP-IVM has helped solve many questions including how FDCs acquire Ags, direct visualization of Ag uptake or visualization of FDC/B cell interactions. Nevertheless, in vivo imaging and MP-IVM have also questioned a lot of studies and model, notably concerning the germinal center cyclic model (reviewed in •), the differences between the dark zone and the light zone and the B cell circulation within GC. These questions are to be added to those already existing, such as the exact origin of the FDCs and FDCs accessory activities (reviewed in •). ●● This reference explains the germinal center structure as well as germincal center dynamics and reactions before the use of multiphoton intravital microscopy. 3. M. G. Hanna Jr., A. K. Szakal: Localization of 125I-Labeled Antigen in Germinal Centers of Mouse Spleen: Histologic and Ultrastructural Autoradiographic Studies of the Secondary Immune Reaction . 1968, [no volume]. 7. Gonzalez SF, Degn SE, Pitcher LA, Woodruff M, Heesters BA, Carroll MC: Trafficking of B cell antigen in lymph nodes . Annual review of immunology 2011, 29 :215–233. ●● This paper discusses the fate of a lymph-borne antigen and their entry into B cell follicle, including the ways FDCs acquire Ag. It also summarize B cell trafficking within LN. 8. Anderson AO, Anderson ND: Studies on the structure and permeability of the microvasculature in normal rat lymph nodes. The American journal of pathology 1975, 80 :387. 9. Bajénoff M, Germain RN: B-cell follicle development remodels the conduit system and allows soluble antigen delivery to follicular dendritic cells . Blood 2009, 114 :4989–4997. ●● This study identifies the mechanism of antigen active transport to FDCs using multiphoton intravital microscopy. 21. Szakal et al. : A novel in vivo follicular dendritic cell-dependent iccosome-mediated mechanism for delivery of antigen to antigen-processing cells. 1988, [no volume]. 23. Wu: Follicular dendritic cell-derived antigen and accessory activity in initiation of memory IgG responses in vitro. 1996, [no volume]. 24. Qin D, Wu J, Carroll MC, Burton GF, Szakal AK, Tew JG: Evidence for an important interaction between a complement-derived CD21 ligand on follicular dendritic cells and CD21 on B cells in the initiation of IgG responses . The Journal of Immunology 1998, 161 :4549–4554. 25. Aydar Y, Sukumar S, Szakal AK, Tew JG: The influence of immune complex-bearing follicular dendritic cells on the IgM response, Ig class switching, and production of high affinity IgG . The Journal of Immunology 2005, 174 :5358–5366. 26. Wu Y, Sukumar S, El Shikh ME, Best AM, Szakal AK, Tew JG: Immune complex-bearing follicular dendritic cells deliver a late antigenic signal that promotes somatic hypermutation . The Journal of Immunology 2008, 180 :281–290. 27. Tew JG, Wu J, Fakher M, Szakal AK, Qin D: Follicular dendritic cells: beyond the necessity of T-cell help . Trends in immunology 2001, 22 :361–367. 31. Aydar Y, Wu J, Song J, Szakal AK, Tew JG: FcgammaRII expression on follicular dendritic cells and immunoreceptor tyrosine-based inhibition motif signaling in B cells . European journal of immunology 2003, 34 :98–107. ● This paper is the first to visualize B cell dynamics within GC and to question the classical GC model described in the first reference. ● Reference 35 is the first to visualize the capture of cognate antigen from FDCs by cognate B cells. Hence this study identify in vivo FDCs as a source of B cell antigen. ● This review summarizes the discoveries concerning FDCs phenotype, thus giving insights into FDCs origin and functions. 42. El Shikh MEM, El Sayed RM, Wu Y, Szakal AK, Tew JG: TLR4 on follicular dendritic cells: an activation pathway that promotes accessory activity . The Journal of Immunology 2007, 179 :4444–4450. ● Reference 42 establishes the absolute requirement of FDCs for follicle identity, GC identity and humoral reponse. 45. Koopman G, Parmentier HK, Schuurman HJ, Newman W, Meijer CJ, Pals ST: Adhesion of human B cells to follicular dendritic cells involves both the lymphocyte function-associated antigen 1/intercellular adhesion molecule 1 and very late antigen 4/vascular cell adhesion molecule 1 pathways. The Journal of experimental medicine 1991, 173 :1297–1304. 46. Batista FD, Iber D, Neuberger MS: B cells acquire antigen from target cells after synapse formation . Nature 2001, 411 (6836):489-94. 47. Koopman: Adhesion through the LFA-1 (CD11a/CD18)-ICAM-1 (CD54) and the VLA-4 (CD49d)-VCAM-1 (CD106) pathways prevents apoptosis of germinal center B cells. 1994, [no volume]. 48. Carrasco YR, Fleire SJ, Cameron T, Dustin ML, Batista FD: LFA-1/ICAM-1 interaction lowers the threshold of B cell activation by facilitating B cell adhesion and synapse formation . Immunity 2004, 20 :589–599. ● This review proposes a new insight into the organization and the dynamics regarding the GC and germinal center reactions.